Take Four Minutes To Reflect On Your Place In The Cosmos : 13.7: Cosmos And Culture This New Year, stop to consider the point of it all with this beautiful animation of Carl Sagan's "Pale Blue Dot" meditation on Earth's place in the cosmos. In 2013, NASA's Cassini spacecraft captured this image of Earth from Saturn. 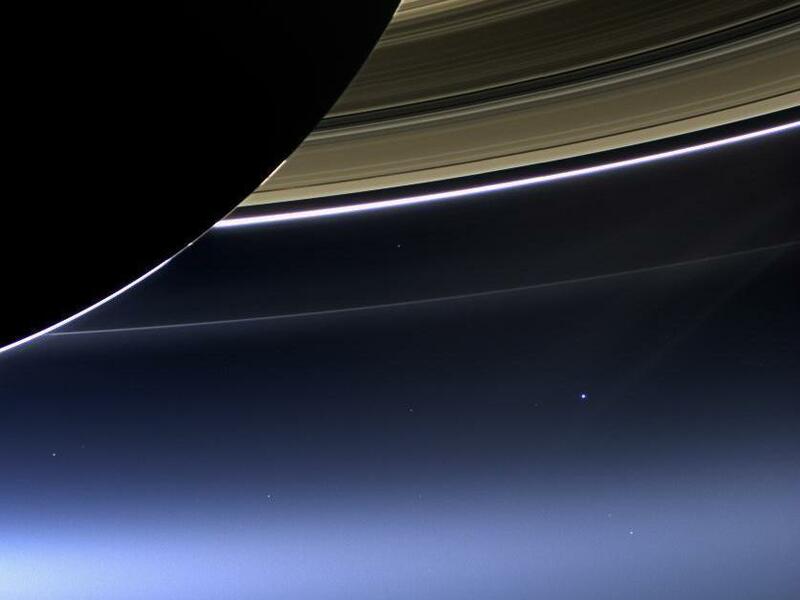 Seen here, our planet is 898 million miles away (1.44 billion kilometers) and appears as a blue dot at center right. So it's New Year's Eve again and that means resolutions — resolutions to stop this and resolutions to start that. We resolve to be thinner, to get stronger, to focus more, to be spontaneous. But regardless of our resolutions and regardless of our ability to achieve those resolutions, our lives on this lonely cosmic outpost, this "Pale Blue Dot," continue on. Until, of course, they don't. And that, in itself, is something to consider as we gird our loins for another of our yearly treks into resolution-land. What, really, is the point of it all? To answer that question you could turn to religion or you could turn to philosophy or, best of all, you could turn to Carl Sagan (with an assist from Adam Winnik and Hans Zimmer). It may not help you with your New Year's resolutions, but it will fill you with a sense of pure wonder.